The social media world is constantly changing. It can be hard to keep up with all of the latest features and policy updates, so we’ve made it easy for you to stay in the loop by creating a monthly roundup of what’s new on Facebook, LinkedIn, Instagram, and Twitter. This month, Facebook changed some of its advertising metrics, while LinkedIn made it easier to schedule meetings through Messenger. Meanwhile, Instagram made an exciting shopping update and Twitter continued to test a host of new features. 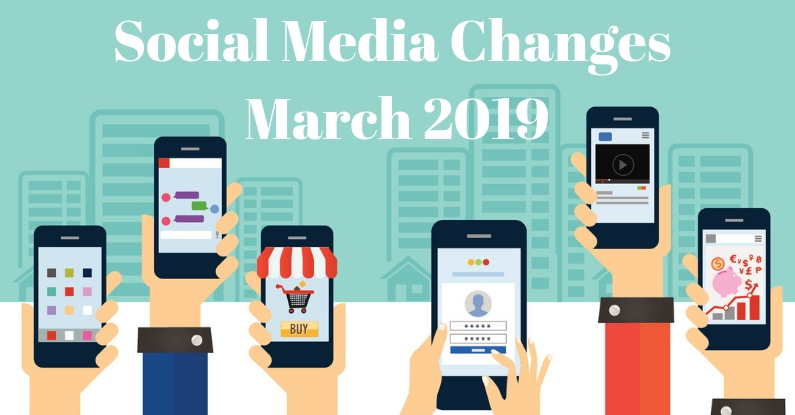 Read on for more noteworthy social media changes that happened in March 2019. This month, Facebook announced changes to how it will measure the relevance of ads. Before, Facebook used a relevance score to measure whether ads were relevant to the audiences they reached. Facebook has now broken down the relevance score into three categories to help advertisers get a better idea what tweaks they need to make to improve their ad’s performance. Quality Rank — How your ad’s perceived quality compares with ads from your competitors. Engagement Rate Ranking — How your ad’s expected engagement rate compares with ads from your competitors. Conversion Rate Ranking — How your ad’s expected conversion rate compares with ads from your competitors. Forget live tweeting, Facebook is making strides to become the place to be for live chatting about televised events! This month, Facebook announced plans to expand its Watch Party feature to allows users to watch and discuss TV shows in real-time. Facebook will begin testing the new feature with live sports events like UEFA Championships League soccer matches so fans can have the chance “to cheer, debate and commiserate on Facebook while watching their favorite match-ups.” More features that might be added to the experience in the near future include trivia questions, fun facts, and live polls. Scheduling meetings online can be a hassle, especially when it comes to coordinating calendars — after all, we’re all busy people! But now, LinkedIn is making scheduling easier with their newest update to LinkedIn Messenger. Now when you’re chatting on LinkedIn Messenger to schedule a meeting, you can share your availability through a new “Availability” calendar button. LinkedIn will then access your local calendar to find available times and can also help you find a place to meet by allowing you to find and share locations in your chat. LinkedIn is continuing to refine its advertising tools. Just this month, they launched three new advertising tools to help advertisers increase the scale of their advertising and improve ROI. Lookalike Audiences, which combines the traits of your ideal customers with LinkedIn’s member and company data to reach new audiences similar to your existing customers. Audience Templates, which provide more than 20 predefined B2B audiences with characteristics like skills, job titles, and group memberships to help you set up your targeting faster. Interest Targeting With Microsoft Bing Search Data, which allows you to target people based on your audience’s professional interests on LinkedIn and according to the professional content they engage with through the Bing search engine. Are you ready for some late-night impulse shopping? This month, Instagram expanded its shopping capabilities with a new Checkout feature, which lets you make purchases directly through the app. To buy products on Instagram, all you have to do is click the “checkout on Instagram” button on brands’ product posts. Once you click the checkout button, Instagram will lead you to color and sizing options before taking you to payment information. To make the checkout process even easier, you’ll only need to enter your name, email, billing information, and shipping address the first time you check out. You will also receive updates about your purchases right in the app, including shipping and delivery notifications. Brands set to roll out this feature in the coming weeks include Adidas, Burberry, H&M, Nike, Dior, Uniqlo, and with more to come. I don’t know about you, but my wallet is definitely not ready for this! Have you outgrown your Instagram username? Well, now you’re in luck! Instead of having to create a whole new account, Instagram might soon let you choose a new username. The platform is currently testing a feature that would allow users to test out new usernames while keeping their old ones on reserve for 14 days — just in case you change your mind again. This month, Twitter launched its prototype app, Twttr, which they will use to test updates before officially rolling them out. Some updates currently being tested include nested replies in threads, hidden engagement statistics on tweets (like the number of likes and retweets), and the option to hide side conversations in threads. If you’d like to sign up for twttr and test out the newest features before they’re official, you can find the application for the app here. Twitter will soon debut an analytics tool that measures video engagement, called Timing is Everything. According to newsX, the tool is meant to help publishers “perform more efficiently and generate large revenue” and will show statistics like video streaming numbers and what time of day videos are getting the most views so publishers can maximize engagement and viewership. The more analytics, the better! That’s it for now! We’ll be back next month with more social media updates. In the meantime, you can read our full Social Media Changes Report for March 2019 on AdvisorU.